According to Nielsen and MMAPayout.com, the UFC on Fox 27 main card on FOX garnered 1,770,000 viewers. The event was headlined by Ronaldo Souza vs. Derek Brunson. Ratingswise, it the lowest-rated UFC on Fox card ever. The previous low for the UFC events on the network was August 2016’s UFC on Fox 21, which drew 1,983,000 viewers. That event, however, was preempted in 15 markets due to preseason football. The final rating was an increase from the “fast overnight” rating of 1.59 million viewers. 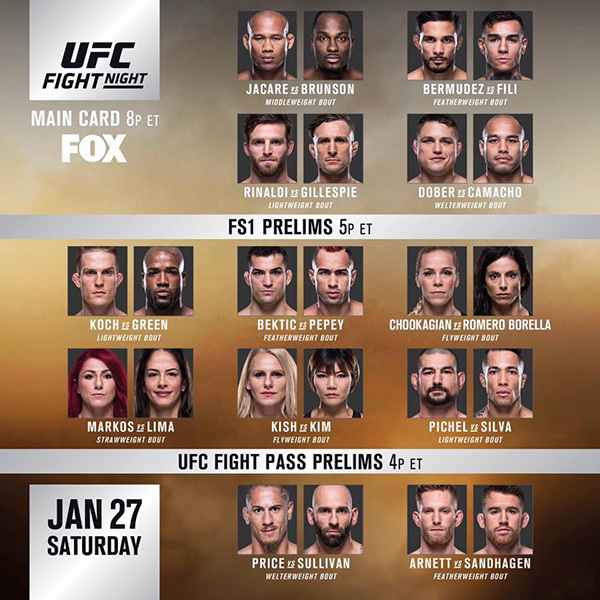 The main event drew 2,224,000 viewers, which is the second-lowest rating for a main event since Demian Maia-Carlos Condit at UFC on Fox 21, which, as indicated, was preempted in certain markets. UFC on FOX 27: Jacare vs. Brunson 2 takes place January 27, 2018 at Spectrum Center in Charlotte, North Carolina.